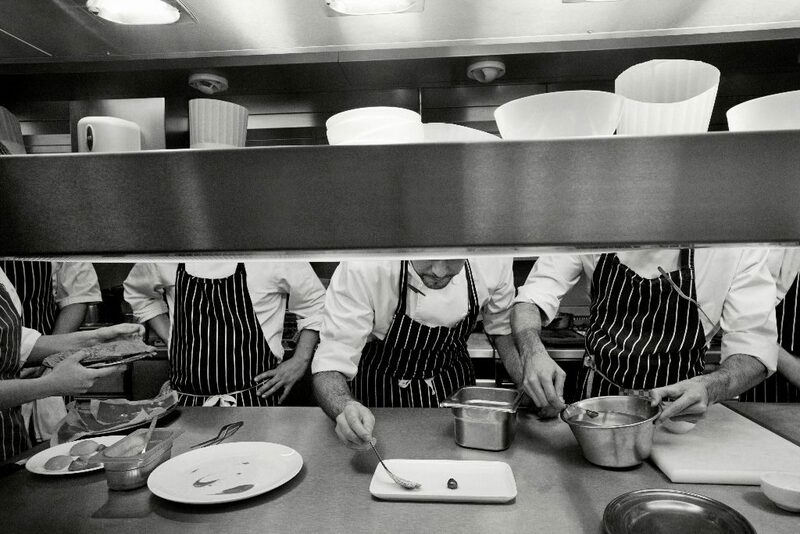 The area around San Sebastián, in the Basque region of Spain, is often said to hold the world’s highest concentration of Michelin stars. 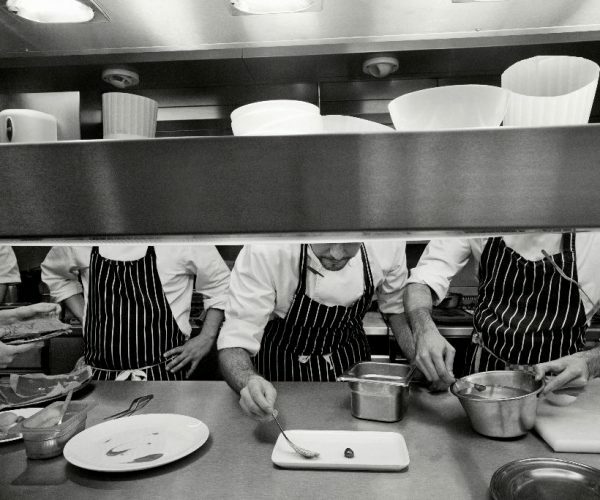 Among the restaurants in the town is the three starred Arzak, which presents innovative, regularly changing dishes with their roots in Basque cuisine. 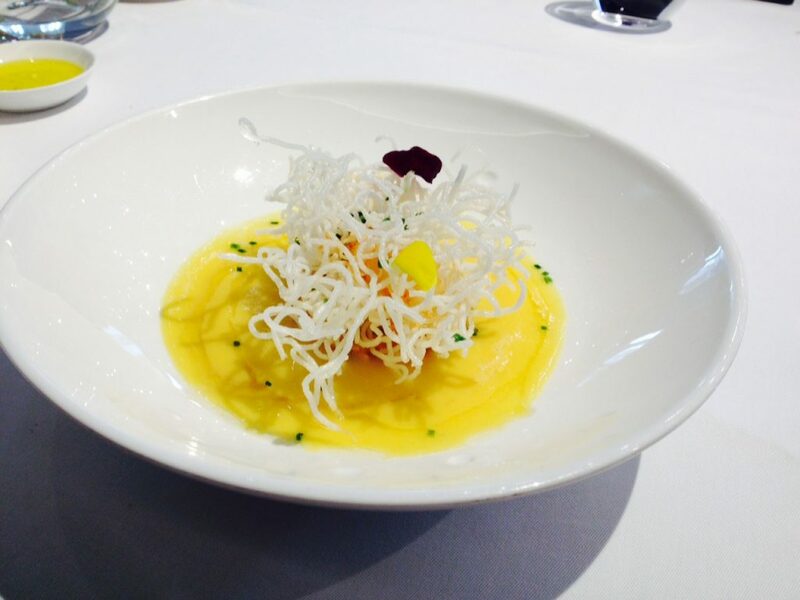 As a resident of the UK, it might be considered a trifle extravagant to travel to Spain for dinner but a sample of Arzak’s delights can be experienced in London, at Ametsa with Arzak Instruction, at The Halkin by COMO hotel. 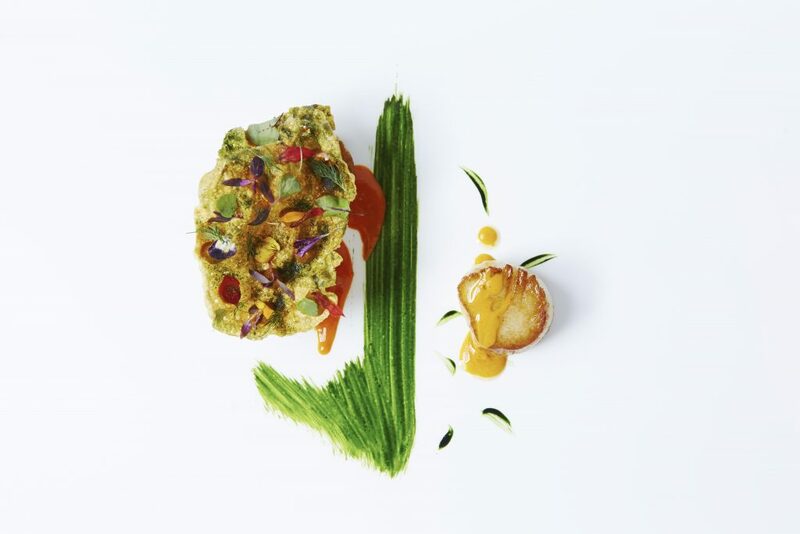 Arzak Instruction is a company created to consult and support restaurants across the world, bringing a little Arzak magic and, by advising on everything from menu creation to staff training, ensuring that affiliated restaurants meet the extremely high standards of Juan Mari Arzak and his daughter, Elena, from the restaurant in San Sebastián. 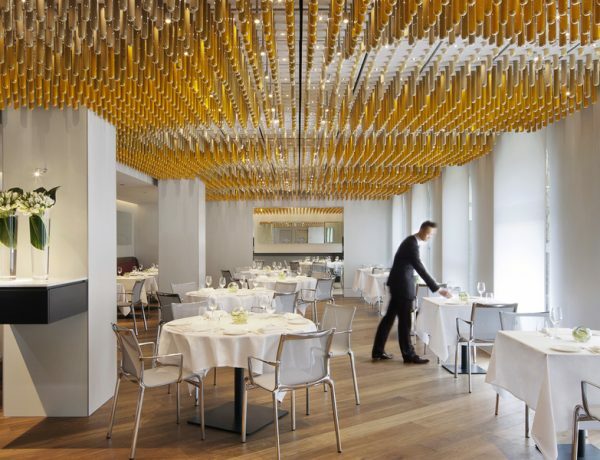 Ametsa with Arzak Instruction is tucked away behind the lobby of The Halkin, conveniently located only a lift ride away from our hotel room so we could avoid the late summer squalls that were chasing other diners into the lobby. Shown to our window seat by the helpful Enrique and Miriam, we took in our surroundings. The furnishings were mostly soft grey or white, with a long banquette of earthy red along one wall, but the most striking feature was the ceiling, which was decorated with hanging tubes containing various brightly coloured spices. We ordered a glass of Louis Roederer and plumped for the tasting menu, with some minor amendments that the kitchen was happy to accommodate. Our appetisers, which were jaw-droppingly presented at varying heights – some even on rather dangerous looking spikes – consisted of lotus root with fish mousse, chorizo wrapped in mango, kataifi with scorpion fish cake and duck paté toast. 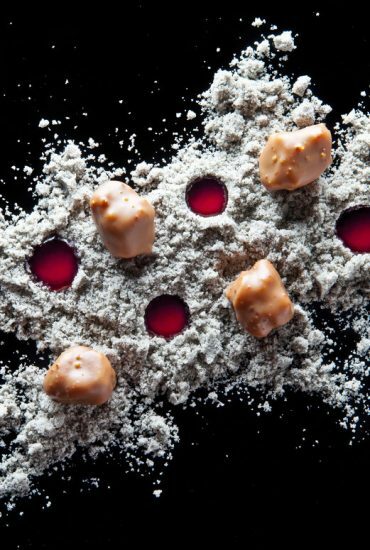 These bite-size morsels set the tone for an intriguing tour of the Basque region’s culinary heritage – not to mention a glimpse into its future. My favourite was definitely the scorpion fish, which was smoky and smooth-textured in contrast to the light wisps of the kataifi, while Charlotte was particularly keen on the combination of duck and apple. Unusually, the following wine was La Gitana Manzanilla, a kind of sherry that is salty on the first taste and softens in combination with food. This was a really interesting choice and went so well with the food that Charlotte and I were fighting the urge to rush through this potent glass! 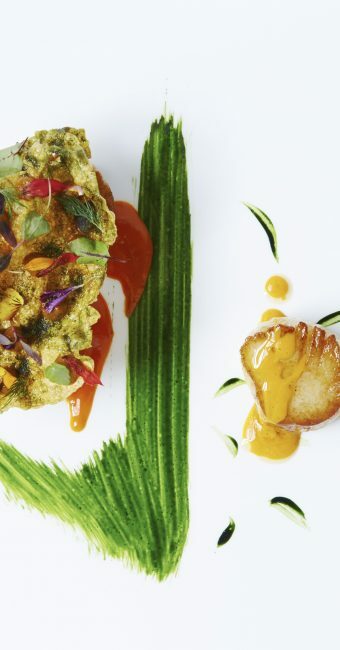 Not only in taste, but to the eye, the food at Ametsa is a work of art. 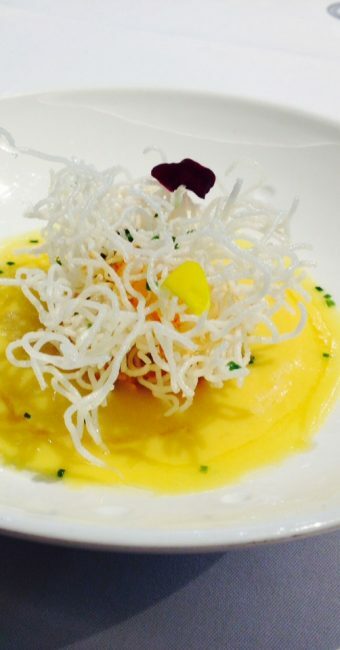 My next dish resembled a child’s drawing of the sun with its bright yellow disc of creamed sweetcorn, king prawns and spider crab, but was topped with colourful petals and a heap of crispy noodles. These soaked up the sweet and salty flavours when stirred in, but retained just enough crunch. Charlotte briefly diverged from the tasting menu and enjoyed some juicy, ‘Joselito’ iberico ham on tomato-rubbed country bread. The wine paired with our next two courses was a much more mineraly, palate-cleansing Raventós Silencis 2012 from Penedès, which gave the illusion of being a little sparkly and was lovely after the sherry. It was an excellent choice for both of the strongly flavoured fish dishes that followed. First, we had a crumbed poached egg, covered in tender squid noodles, in a rich, strikingly black, squid ink sauce which was quite sensational when combined with the runny yolk. The final fish dish was a seared tuna steak, perfectly blackened on the outside and still red in the centre, with black ‘Mojo’ sauce and an additional sauce, made from capers and gherkins. However, the most curious items on the plate were tiny shallots with cantaloupe melon pieces inside, which were most unexpected and delicious. 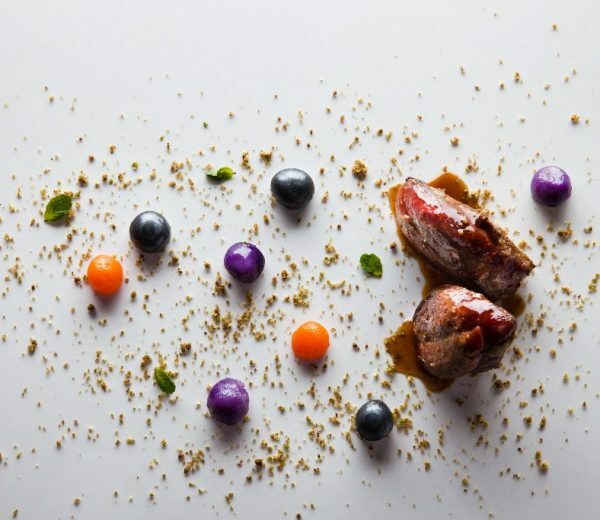 Our main course was ‘Pigeon with shot’ – rare, succulent pigeon breast with spheres of butternut squash, purple potato and silver pearls of liquid vinaigrette that burst in the mouth. The wine was a Descendientes de J. Paclacios, Petalós de Bierzo 2011, fruity on the nose and earthy on the palate, rich with blackcurrant and berry. The restaurant manager, (José) Godoy, who had very kindly come to talk with us about the best places to eat and stay in the Basque region, informed us at this point that he had a surprise for us. Expecting a cocktail or an interesting experiment from the kitchen, Charlotte and I continued eating our cheese course, a delightful combination of creamy Manchego and sharp Idiazabal (both Spanish cheeses, of course! 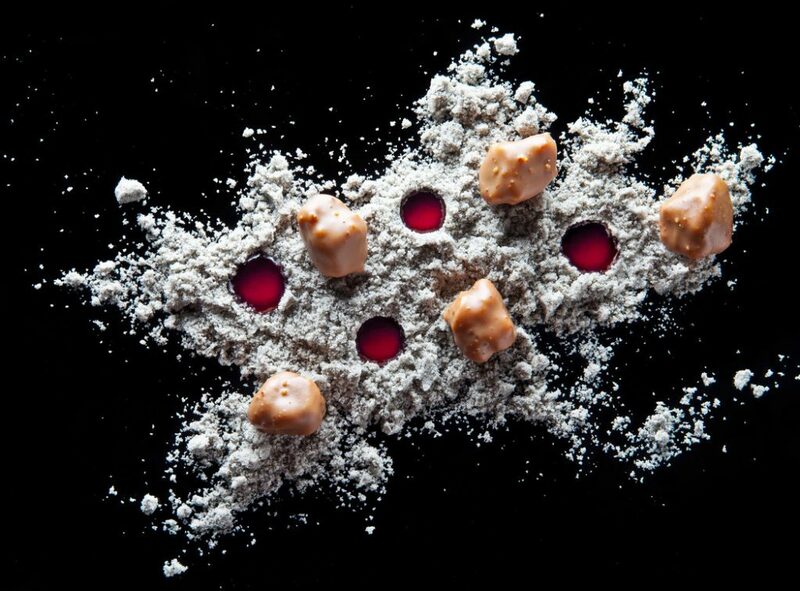 ), served with honeycomb and an aged Pedro Ximinez Triana sherry, from the same cellar as the manzanilla. However, we were completely astounded when the lovely Elena Arzak herself approached our table. As it turned out, she was eating at Ametsa and staying at The Halkin by COMO while on business in the UK. It was a great pleasure to be able to inform her how much we had enjoyed our dinner so far and compliment the excellent work of Ametsa’s Executive Head Chef Sergi Sanz. As we told Godoy afterwards, speaking to such a talented chef at length about food was quite the best surprise that he could have orchestrated. Before our final course, we were given a sweet dish that is somewhat of a signature of the restaurant, ‘Piedras Lunares’ or ‘moon rocks’. These curious lumpy items come with unusual silvery sand and two circles of red gel. Now, I firmly believe that, if menu items are not explained prior to dining, writers should not give the game away. If you want to find out what Ametsa’s ‘moon rocks’ are, you should go yourself! Trust me though, they are intriguing and divine! Charlotte and I had chosen different desserts with which to end the meal and, as usual, we were both very content with our choices. Food envy has no place here. With Charlotte’s preference for light desserts, she had opted for French toast with mango and coconut, which was creamy, sweet and very moreish. My heavenly dessert was called ‘Oh! Pera’ and was a take on the Parisian opéra gateau with chocolate covered almond and sponge slices, confit pear, and pumpkin and coffee ice cream. 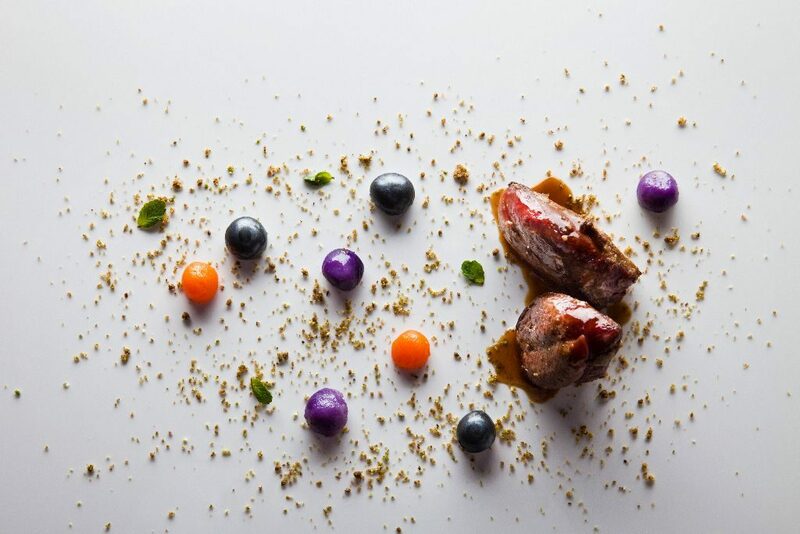 A good tasting menu will take you on a journey and the Arzak team have overseen the creation of a menu that vividly recalls the flavours of Basque cuisine and goes beyond them, a menu that celebrates colourful and creative expression of traditional fare. 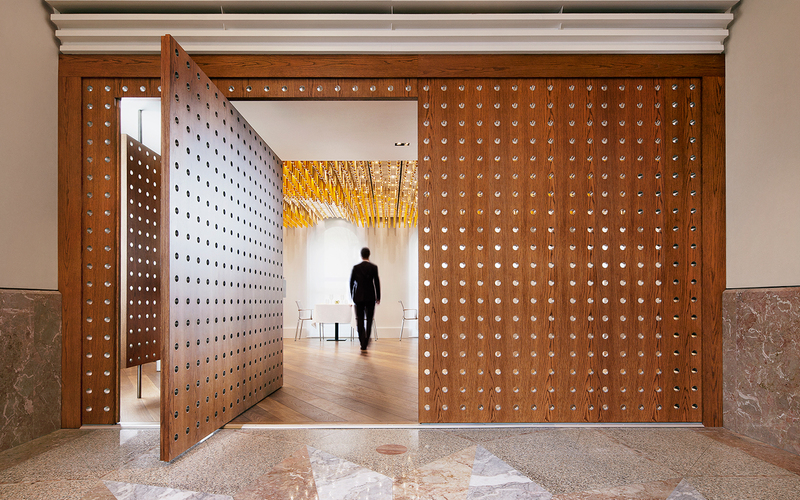 With the wind and rain of London’s summer blatting against the windows, we were very content to head back to our room at The Halkin having enjoyed a dinner with sunshine in every mouthful.